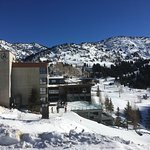 I just returned home from three nights at the Rustler with a friend for a ski weekend at Alta. I loved the food, the service, the vibe, and the slope-side location can't be beat. My friend and I shared a room to keep costs down. Our room was in the back and super quiet. I slept like a log. 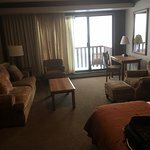 The room was huge, nicely furnished, well-kept and clean. We ate breakfast and dinner each day in the dining room, and the food was excellent (those meals are included). They have a buffet breakfast with an omelette station. For dinner they serve a four-course menu, starting with soup and salad, an entree and dessert (I'm not a big dessert person but I couldn't pass up the lavender cheese cake). For my entree I had trout one night and salmon another night. The menu is extensive, and there are a lot of healthy choices. The view from the dining room is breathtaking. On our first night we arrived late, around 11 pm, and the staff had sandwiches waiting for us, a nice touch. What else? We spent lots of time in the cozy bar, which has a dramatic mountain view. Great place to read by the fire. The bartender, John, is super friendly. I ended up renting skis in the shop inside the hotel, a nice convenience. They also sell gear. There are lockers to store skis on the level of the hotel with access to the slopes, and boot warmers in the room. A small chairlift carries guests right to the Rustler. I didn't notice a lot kids during my stay, but I look forward to going back with my 13-year-old who skis. Thank you for your comprehensive and complimentary review! We look forward to hosting you again when you can bring your teenager out to ski. Conditions are terrific right now and we can't wait to have you back to stay with us. Thank you for writing such a lovely review.